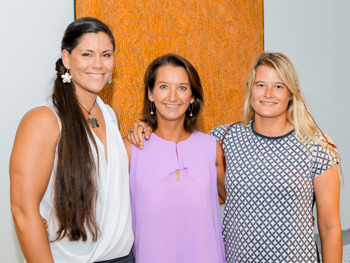 After 15 years and 500 scholarships, Layne Beachley will pass the baton on to the alumni of the Layne Beachley Aim For the Stars Foundation. The Foundation provides scholarships to Australian women to help transform their potential into reality. "The Foundation was built on the concept of women empowering one another and the time is right for me to step away and pass on this legacy to others. Now the focus of The Foundation is to handover five game changing grants to former recipients who have started their own causes," commented Beachley. The Foundation is fundraising for the final five grants at their annual gala event on 31 August and during two hikes in Tasmania this November. The grants will be awarded to recipients whose focus has a significant community impact. Entries will open this September and winners announced in October. This news coincides with the announcement of the 15 recipients of this year's scholarships who range from women in the arts to providing community support in mental health and financial literacy. Layne will continue to mentor young women and men outside of The Foundation - including in her role as Chairperson of Surfing Australia focusing on the upcoming Tokyo 2020 Olympics. Recipients throughout The Foundation's history include women working with people with disabilities, scientific health research, indigenous wellbeing, aged care, education in remote and rural areas, environmental studies and world-class performers in ballet, dance, theatre, sport and music. Question: Why have you decided to close your foundation, Aim for the Stars? Layne Beachley: After 15 years, I have decided to step back and allow the country's young stars to shine. The Foundation was built on the concept of women empowering one another and the time is right for me to step away and pass on this legacy to others. I'm extremely proud of everything we have achieved and it's time for me to take a breath and reset. Question: Was this a difficult decision to come to? Layne Beachley: It was one of the toughest decisions I have ever had to make! Since the Foundation started in 2003, 500 women and girls have received financial and mentoring support. Whilst it's hard to walk away, the time is right to pass the baton on, as I wish to focus my energy and attention into other areas of life. Question: Who have you chosen to pass Aim for the Stars' final funds on to? Layne Beachley: Entries will open to past recipients who wish to apply for one of five final grants at the beginning of September. The grants will be awarded to recipients whose focus and program has a significant community impact. Question: Can you tell us about some of the success Aim for the Stars have had? 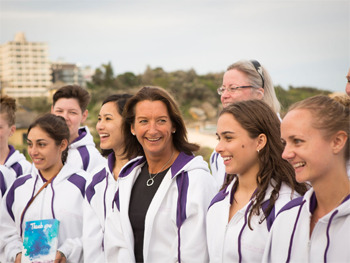 Layne Beachley: The Foundation provides scholarships to Australian women to help transform their potential into reality. Our grants and mentoring support have empowered these women to become world champions, succeed in business, expand their network and increase their confidence. Our belief in them has fuelled their self-belief. Successful recipients include women working with people with disabilities, scientific health research, indigenous wellbeing, aged care, education in remote and rural areas, environmental studies and world-class performers in ballet, dance, theatre, sport and music. Question: What advice do you have for young girls with big dreams? Layne Beachley: Set yourself a goal, have the courage to dream big and don't be afraid to ask for help when you need it. Surround yourself with people who believe in you. Question: Where do you find motivation? How can we stay inspired? Layne Beachley: Motivation is the result of your decision making process and choosing to do things you love to do. Make the time to do something you enjoy every single day! My motivation comes from a daily gratitude practice, surfing and helping people live a more inspired life. Layne Beachley: My goal for the next 12 months is to write another book on sharing the lessons I have learnt since retiring from professional surfing and roll out a corporate leadership program based on the 3 C's of leadership; Clarity, Courage and Confidence. I will continue to mentor men and women outside of my foundation in my role as Chair of Surfing Australia in the lead up to the Tokyo 2020 Olympic Games and as a member of the Sport Australia Hall Of Fame scholarship and mentoring program.